For Samsung Galaxy S8 S9 S8 Plus S9 Plus Note 8 Note 9. Genuine New Akg Earphones For Samsung S8 S9 PLUS Headset Headphones With Mic. • Galaxy S6 / S7 / S8 / S9 & Plus / Mini models. • Compatibility with;. • Galaxy A3 / A5 / A7. • Galaxy Note 4 / 5 / 8. • General Feature. • Color Titanium Gray. • Cable Length 1.2 m. • Physical specification. Original AKG Earphones Headphones for Samsung Galaxy s8 s9 s9 Plus Note 8 & mic. 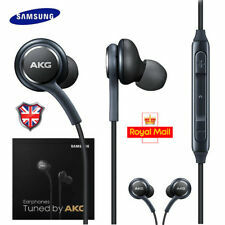 The Samsung Genuine headphones are Tuned by AKG provide an incredibly clear, authentic-sounding, and balanced output. Tangle-free earphones tuned by AKG Sleek classic design with a comfortable fit. Wired earphones tuned by AKG with tangle-free, fabric cable. This is the newest model upgraded for your Galaxy S8 / S8 Plus / S9 / S9 Plus. Samsung AKG Earphone Headphones for Galaxy S8/S8 Plus S9/S9 Plus with mic. 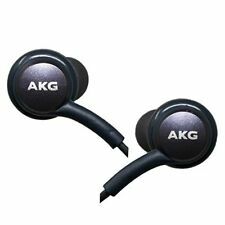 Genuine Samsung Headphones Tuned by AKG. Genuine Hands-free For SAMSUNG S8 S8 Plus S9 PLUS S10 S10 Plus AKG. Condition is New. Dispatched with Royal Mail 1st Class Letter. 2 PACK New Akg Earphones For Samsung S8 S9 PLUS Headset Headphones With Mic. • Galaxy S6 / S7 / S8 / S9 & Plus / Mini models. • Galaxy Ace / Ace 2 / Ace 3 / Ace 4. • Galaxy Note 4 / 5 / 8. • Galaxy A3 / A5 / A7. • Galaxy J3 / J5 / J7 - All years. • General Feature. • Compatibility with;. Compatibility Smartphone compatibility Galaxy S8 , Galaxy S8, Galaxy S7 edge, Galaxy S7, Galaxy Note 5, Galaxy S6 edge , Galaxy S6 edge, Galaxy S6, Galaxy S5. Enjoy easy access to a range of your device's features with the earphones in-line remote. Galaxy S9, Galaxy S8 , Galaxy S8, Galaxy S7 edge, Galaxy S7, Galaxy Note 5, Galaxy Note 7, Galaxy Note 8, Galaxy S6 edge , Galaxy S6 edge, Galaxy S6, Galaxy S5. Headphones For Samsung Galaxy S8 and S8 Plus, Genuine Black AKG [EO-IG955] Samsung Earphones Headset For Galaxy S8 & S8 Plus. Samsung galaxy s9 original earphones from the box. You will get just the brand new earphones as shown in the pictures. They will be securely packed for delivery to avoid any damage. Thanks. Samsung S8. Samsung S8 Plus. Samsung Galaxy S4. Samsung Galaxy S5. Samsung Galaxy S6. Samsung Galaxy Note. Samsung Galaxy Note 2. Samsung Galaxy Note 3. These headphones represent unparalleled value for money. The Galaxy S8 AKG by Harman Kardon headphones are serious quality at a very affordable price! Original AKG Headphones For Samsung Galaxy S9 S8 S8 Plus Earphones Handsfree. These headphones represent unparalleled value for money. Samsung Galaxy S9/S9/S8/S8 Plus Headphones - Tuned by AKG. Enjoy easy access to a range of your device's features with the earphones in-line remote. Samsung Earphones Tuned by AKG. Tangle-free earphones tuned by AKG Sleek classic design with the comfortable fit. 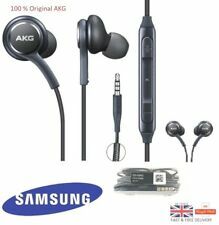 Original AKG Earphone for Samsung Galaxy S9 / S8 / S7 / Note 8. • Galaxy S6 / S7 / S8 / S9 & Plus / Mini models. • 3.5mm headphone connector -Yes. • Microphone -Yes. • Galaxy Note 4 / 5 / 8. • Galaxy A3 / A5 / A7. 100% Original AKG Headphones Earphones Handsfree For Samsung Galaxy S8 S9 Plus. Condition is New. Dispatched with Royal Mail 1st Class. AKG Headphones for Samsung Galaxy S9 S9 S8 S8 Note 8. Genuine OEM AKG Samsung Product - Model Number- EO-IG955. Compatible with Samsung Galaxy S6 S7 Edge S8 S8 Note 8 or any device that have 3.5mm port. Stereo earphone headset with microphone for talk the phone. The cable is Braided Fabric, very strong, not easy break or tie. 1 x Genuine AKG Earphone. We will reply you as soon as possible during 12 hours. Samsung Galaxy S8 Original Earphones Tuned By AKG EO-IG955. Expertly tuned By AKG. With years of expertise within the audio and headphone market, AKG have expertly tuned these in-ear headphones to produce a balanced audio experience with crisp highs, detailed mids and deep bass, which ensures you can listen to your music the way it was intended to be heard. 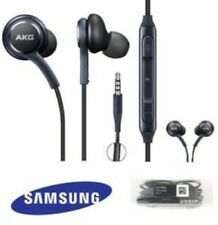 New Samsung Akg Earphones For Samsung S8 S9 PLUS Headset Headphones With Mic. 30 DAYS FREE RETURN! FAST & FREE DELIVERY!